President Bruce opened the meeting by welcoming everyone. He said to us all “This is my last meeting……(pause) …..(pause)……as president”! Everyone laughed. RTN Dora volunteered to sell raffle tickets. Bruce then passed the mike around and everyone introduced themselves. We found out that two of our guests were from the same small town in the US as Bruce’s sister. Small world. As the introductions were going around, Bruce commented on our Honorary Member, Anne Marie and what a great textile artist she is and how she has contributed so many items to our club. He also commented on our newest member, RTN Sue Bishop and her soon to be new member husband, Ray and all that they have done with their clinic Bumi Sahat and how it is helping the people in Bali who do not have access to health care. So, as you can see it was a VERY successful day and a special thank you to our fantastic Community Services Director, Dora! Bruce then mentioned that the next Bumi Sehat ‘Healthy Day’ has been rescheduled to 14 October and details will follow as we get closer. PE Allan then put up for a vote the small changes to our By-laws. Just to allow for more Directors. It passed by a voice vote and previous email votes. A quick flag exchange was done with Jimmy Hsieh, the Previous President of the Rotary Club Temecula Sunset (Calif, USA) club. 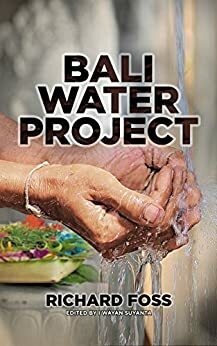 Bruce then discusses our VP Richard Fosses new book on Bali Water Projects. What a great book. Richard spoke about Bali and Indonesian Art. He has been working in that area for the last 10 years he’s been writing about Indonesian Art & Culture. He gave us the actual history of how art & culture came to Bali from Java when Islam invaded Java. He explained how art helped the local people understood their own world and culture. Interestingly he explain how westerners look at paintings and how the Balinese do it. Westerners read from the center out, while the Balinese read different levels. The top level was the gods, the middle was the royalty, and the lowest was the commoners. Originally paintings were made on tree bark and the colors were all natural from leaves (blue), pig stones (white), etc. Klungkung became the center of art in Bali originally. Even though different artists painted differently, art had some strict rules about things like costumes, eye expressions, hand movements, etc. to represent different people, like royalty, etc. Paintings were kept folded up in the temples and the homes of the aristocracy and only used during ceremonies. Ubud’s local Museum Puri Lukisan, opened in 1956, holds the largest selection of this style of paintings and is the oldest museum in Bali. Their oldest painting is from 1605. Modern painting techniques were introduced by several European painters is the 1920s through the 1940s: Walter Spies and Rudolph Bonnet helped the Balinese to use 3-D techniques, balance, and shadowing along with other European styles. Bruce ran through our upcoming speakers for the coming few months. And our next meeting will be Monday, 10 July at Kakiang Garden. A Board Meeting will be held 8 July at Kakiang Garden at 1PM. Guest Ray Bishop was the raffle winner.